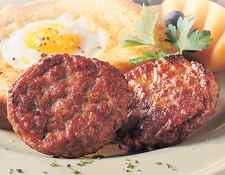 Breakfast sausage recipes are certainly some of most popular recipes used in home sausage making. These recipes are almost always made as fresh sausage rather than being smoked and cured. They're usually made from pork though other meats can be, and are, used. In the U.S., the predominant spice mix for breakfast sausage consists simply of salt, black pepper, and sage. Most of the breakfast sausage made at home is kept in bulk form, but some people do prefer to stuff it into casings. If the sausage is stuffed, smaller sized casings (24-32mm) are most often used. Both natural sheep casings and collagen casings work well. The homemade bulk sausage is typically formed into patties, fried, and served with eggs and/or pancakes for a hearty meal. Breakfast sausage is sometimes referred to as "country sausage". In its basic form it is easy to make and very popular across the nation in one version or another.